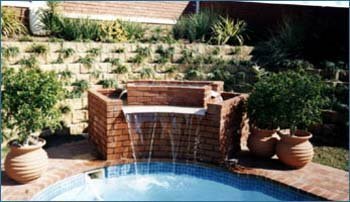 Transform your garden into a tranquil oasis of tumbling waterfalls and bubbling streams with our range of water features for your swimming pool. 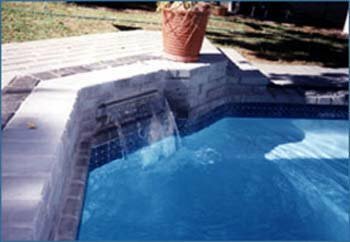 In different unique styles from natural, rough rock forms like a natural waterfall to brick, man-made shapes and structures to minimalist slits in the side of your pool that offer rushing waterfalls without the fuss. There’s the perfect swimming pool water feature for you at Horizon Pools. Water features can also add a style and theme to your garden. Picture lush palms, tropical forest ferns and other flowers surrounding a rocky pool, boasting a great rock ledge where water spills over in a rumbling waterfall. The water spills over the side in trickling streams down rocky outcropping to the water below. All around you birds visit the garden, and with their singing accompanying the backdrop of rushing water you find yourself in the heart of a tropical forest paradise. 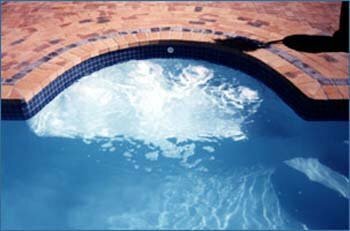 Our team at Horizon Pools has years of experience in not only the installations of fibreglass pools but in the installations of water features as well. A rushing waterfall at the end of your garden can really complete a garden space, creating an aesthetically pleasing environment for family and friends to enjoy on a hot Summer day or warm evening. The kids also enjoy leaping off the ledges into the deep end or playing beneath the pouring water. Horizon Pools is proud to make these fantasies a reality, to set the scene for relaxation and beauty. 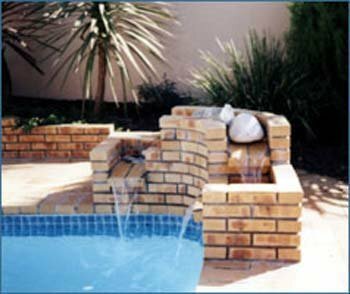 If you’re interested in having one of our swimming pool water features installed, make an enquiry with us today, and we’ll send you our catalogue of available water features.in Cape Town. And if you have any questions feel free to contact us.